We managed to get out of the house by 10:30 on Sunday morning to drive to the Pacific Beach. Along the way we saw rice fields and plantain plantations. Cattle were grazing by the side of the highway. An oxen was resting in the shade in a little bit of a ditch. Horse carts traveled the Pan American highway, and there was even a colt standing in the middle of the road. A boy was herding cattle with a little red flag on a stick and a young bull almost ran in front of a truck. 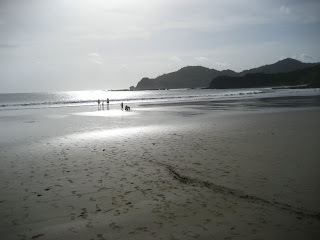 Jonathan was worried about how long it would take to get to the beach, but with the new road from the highway to San Juan del Sur, we drove quickly to Playa Majagual. Only the last 10 KM or so was on a rutted dirt road. This time we didn't drive by the beach turn off. 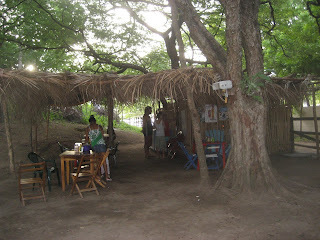 We parked in the yard of the little cooking hut and ordered 4 fish dinners to be brought to us on the beach. We knew from before that his is some of the best food in Nicaragua. We ate grilled swordfish with flavorful sauce, vegetable rice, tostones and salad. It felt really pricy at $6.50 a plate. But we felt like being on vacation. 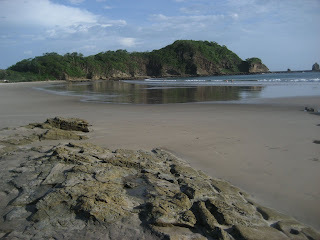 We walked down to the beach, protected in a cove. It has a mild shallow surf. We hung our clothes on the nearest tree and the boys rushed into the water. I sat in the shade for a while and looked at the green hills. Lunch was carried down on real plates. The boys spent most of the time in the water, but Jonathan and I went walking over to the rocks on the north end of the beach. When we came back, the boys were sitting in some warm pools of water in the sand watching the gastropods and segment worms. Jules was able to identify everything because of Marine Biology last year. We all walked together to the other side of the cove looking for animals in the little tidepools in the rocks and talking about other tidepools in other places, all of which were places Noah preferred to be. It was like when the kids were little and we spent hours, days looking at tidepools. To do it with them again felt like a gift. It was really warm, and I told myself I would not feel cold again for a whole year. I want the swordfish lunch.